You'd think since we've moved so many times with children that we'd have some kind of system figured out by now. We don't. Maybe we should try to quit moving when one of the kids is a toddler. Everyone knows that a toddler's goal in life is to create as much chaos as humanly possible in any given second. When Sky was a toddler, he managed to lock all of the suitcases and change the combinations. It took us a full day to get them open again. When Pink P was a toddler, she liked to unpack whatever we packed which resulted in the entire family nearly missing the last possible bus to Narita Airport for our flight back to the U.S. In the end, a friend, one of the other moms from Sky's preschool at the time, had to run with us, dragging along part of our stuff all while carrying a baby strapped to her back. Incidentally, not long after that, we lost touch with that friend, and I can't help but think she dumped us when she realized how just disorganized and incompetent we really are. For the record, she's never moved with a toddler. 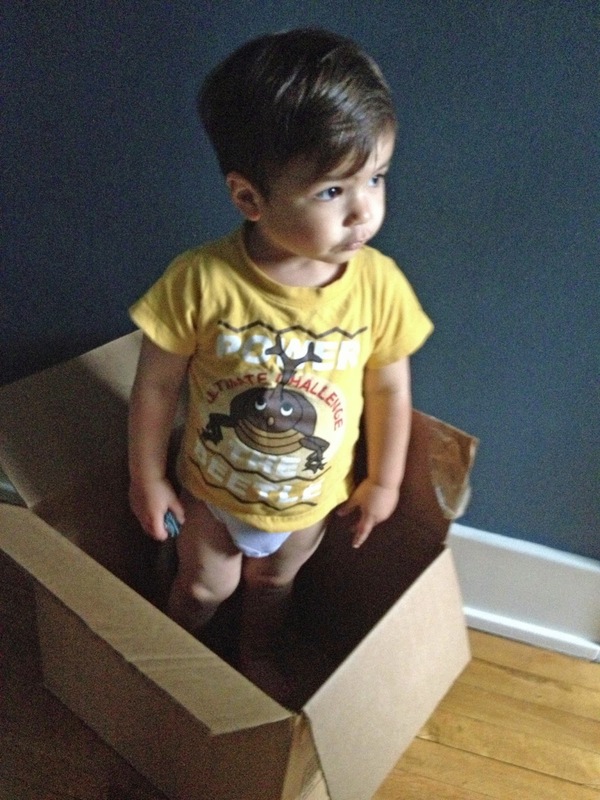 This time around, Stow is our toddler, and his game is climbing into Every. Single. Box. I. Try. To. Pack. Don't let that pensive look fool you. He's probably contemplating the various ways he could take over the world. Ooo, Mommy's winter clothes sure are comfortable. Sure, it's cute. But, here's the thing. When there's a baby in your box, not much else fits. 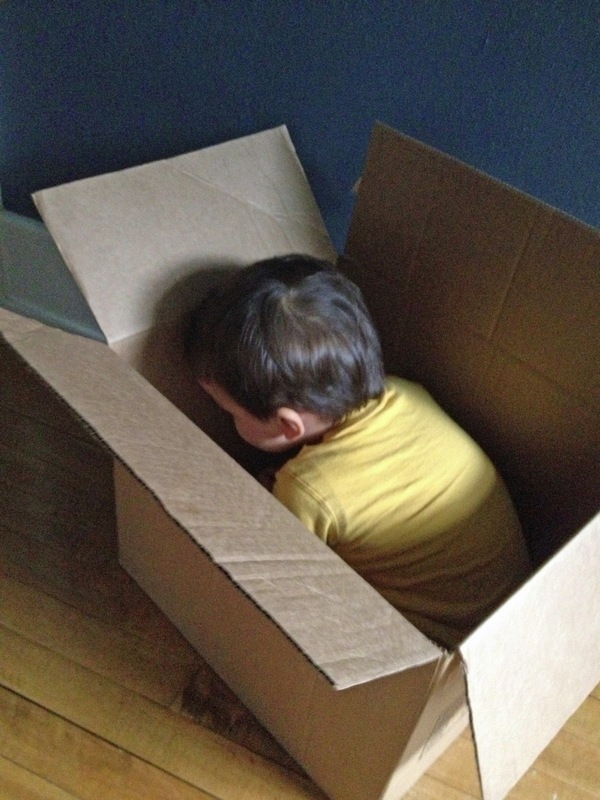 And when the baby gets out of the box, he likes to take whatever he discovered there with him. And, sometimes he even likes to destroy the box. Problem is, when he's not in one of my boxes, he's up to something even more dastardly--like climbing onto the stool in the kitchen to reach the drink sitting on the back of the counter and pouring it all over himself when trying to look inside and then running through the house yelling, "Yucky, Mommy!" drawing me from the room where I'm packing and tricking me into thinking that the yellow "yuck" on his shirt is potty (even though I'd just changed his diaper) when it's really watered-down green tea. 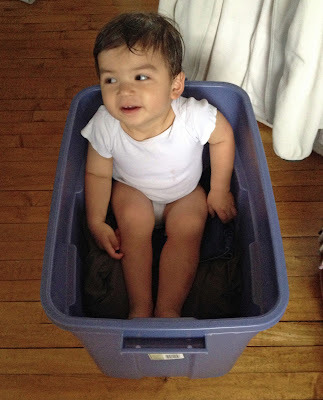 So, yeah, packing with toddlers, not so fun. But it's nothing like trying to help my ASD kid navigate another big change. Just recently, Sky seems to have realized we are going to move. The speech therapist, bless her heart, thought that with a month to go, now would be a good time to start working through various scenarios for moving to a new place and meeting new friends. It makes sense, only, when you give Sky an entire month to anticipate something, it never goes well. During the session, she tried to get Sky to think about some of the challenges that he might encounter when we move. Nothing doing. Apparently, he spent their entire 45-minute session repeating, "I don't want to talk about this. I don't have to talk about this. My mom said I could use the computer" (for the record so not true). He fidgeted. He refused to make eye contact. He became belligerent. And, he managed not to answer a single one of the therapist's questions. The worst part, of course, is that now the move is squarely on Sky's radar. So, he's flipped out. It's not like this is new news to him, but now it's real news. The lack of structure is palpable and nerves have set in. And it's not pretty. He spends a lot of his time running around like a spastic monkey. Three and a half weeks to go. Heaven help us. Wishing you much sang froid over the next couple of months!! Sorry to hear that things are so hard on Sky. Even small changes are really hard for my ASD son. We only moved once (when he was six), and it was really tough. I hope this month flies by quickly for you all!